I am Dr Vandana Thakran and I am very happy and excited to start my new blog “ SACRED SMILES”. I welcome you all in my world of beautiful and confidentsmiles. I love to see smiling faces and making people smile is my passion. It is said that “if your passion is your job or vice a versa than you really don’t have to work hard to earn a living”. I must tell you that I am literally living this phrase. Being a dentist by profession I live my passion each passing day to make people smile!!! I don’t have to sweat harder than to realize my dreams!!! I have named my blog sacred smiles because I really believe in the sanctity of smiles. A real smile will disclose your true self, which is reflected in the eyes. They really bring you closer to each other for only humans have got these muscles which help you smile. I find each and every smile beautiful and strongly believe that one should keep smiling more often because YOU CAN. Every smile increases our face value but definitely we all have got different musculature and different set of teeth, which means that it may differ according to different sense of esthetics. Here I would also like to mention about healthy smiles which is an indicator of healthy teeth and oral cavity. My years in dentistry and my experience as a dental surgeon has taught me that any one can have that great celebrity like smile line because smile makeovers are not just for bolywood or rich. They can be had by anyone who feels that they would improve their self esteem, social engagement, job opportunities by doing that extra bit.
. A well trained dentist can actually make a significant improvement in a patients smile by not necessarily doing a total ‘reconstruction’ of their teeth but by performing a minimal amount of dentistry that makes a subtle but pleasing change to the overall effect of their smile. My passion is to create not only beautiful but CONFIDENTsmiles as confident humans are needed to bring that positive change in society. 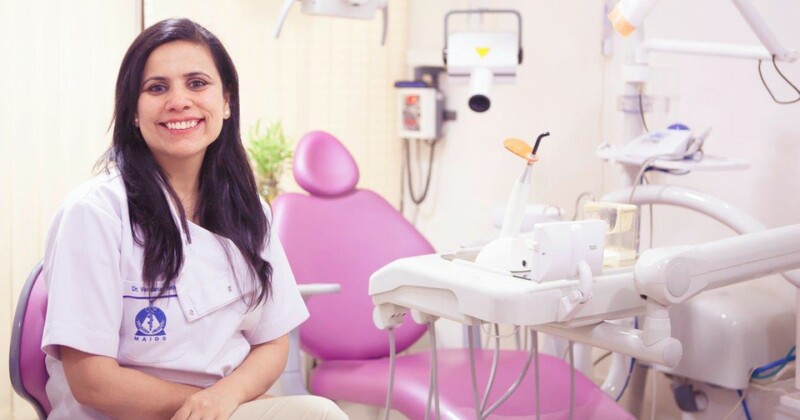 Following my dream, my practice MINT LEAF DENTAL WELLNESS CENTRE was born about 18 months back and now we have two centres in Gurgaon. I did my masters in maxillofacial surgery and have been practising dentistry since last 10 years in few of the premier institutes of INDIA which includes PGIMS ROHTAKand MAMC NEW DELHI. Being a good dentist to me is to be able to detect conditions that would become a more complex problem later on. Something that gets diagnosed early on would mean that my patients would avoid the need for more dental procedures hence saving more money, time and distress in future. Here at my practice, we feel that Dentistry is not just about teeth. It is about our patients feeling comfortable in our skills and knowledge and trusting our intentions to help them. This takes time and patience and an atmosphere and environment that are designed to allow our patients to be heard while they express their fears and concerns. We want our patients to be our partners in their care and to be excited about the fact that they have decided to invest in their health and well being. Our patients are our extended family and we really treat them like family members. Integrity, honesty, compassion, quality, learning, sharing and most of all humility are on the top of my learning list. I may still not be perfect but trying to catch up with all these humane aspects which I learnt during my living years. No one ever gets anywhere by themselves. I am the poster child of this reality. I would like to conclude by mentioning few people & institutions who have been enormous with their help, support, encouragement and most importantly faith in my abilities. My parents Dr and Mrs Sangwan , I m here only because of you , thanks for the life and values instilled. My institutions and all my mentors at PGIMS Rohtak & MAMC New Delhi where I learnt dentistry and made me feel that I could practice successfully with excellence and passion. My patients who inspire me to improve daily so I may earn their confidence & trust. My brothers and sisters (Bhawna, Siddharth, Achraj & Pragati) for liking me and appreciating me , even when I don’t find myself good. My daughters, Dhun& Mehr for giving me the reason to smile and inspire me to work harder for the love of smiles on their faces. You guys give me purpose in life!!! And my husband Dr Arun Thakran who told me to always dream Big and In Colour and made me believe that I could achieve all those dreams. I look forward to having you with me on this journey of sharing information about dentistry, your oral health, and overall health and life lessons that I learn every day about living with passion! Till then stay happy and smile confidently!! !